The unique agitator bead mill for development work and formulations — the DYNO®-MILL RESEARCH LAB — is used for the continuous dispersion and wet fine grinding of pumpable products with low to high viscousity in the micron to nano range. The DYNO®-MILL MULTI LAB is used in research, development, cell disruption and small scale for dispersion and wet grinding in all industries.For discontinuous operation with interchangeable grinding containers of 0.15 and 0.3 litre and continuous operation with grinding containers of 0.3, 0.6 and 1.4 litre. The flexibility of the machine and the availability of contacted parts in so many different materials make the MULTI LAB an ideal laboratory mill to fulfil all requirements. The DYNO-Mill KD agitator bead mills with horizontal grinding container for dispersion and finest wet grinding in a completely enclosed system. 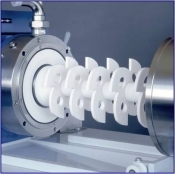 The DYNO-Mill is suitable for all kinds of products  from low to highly viscous pumpable products. The DYNO®-MILL ECM is successfully used for very high capacities working in either the passage process mode or in a recirculation mode. The grinding beads are accelerated in the DYNO®-MILL ECM by the patented DYNO®-Accelerators. The unique construction allows to build up of internal grinding bead circuits, which guarantees a narrow dwell-time spectrum as well as the maximum energy input.